RAISE UR PAW NEWS: NEWS: Factory Farmer buries animals alive and laughs about it. NEWS: Factory Farmer buries animals alive and laughs about it. As an animal activist/advocate and creator of Raise Ur Paw – I have read many articles and stories of animal cruelty, abuse and slaughter – such barbaric and inhumane acts that are crimes against nature. This time I came across a sickening story that CNN broke, about a PILGRIM’S PRIDE CHICKEN SUPPLIER who was caught – thanks to hidden camera, laughing as he buried animals alive. The shocking and disturbing video was taken by an undercover investigator with Compassion Over Killing and shows the disturbing footage of workers dumping sick chickens by the bucketloads into a pit where they were left to die slowly. 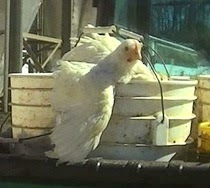 Apparently, Tim Prince, the owner of the factory farm had admitted to CNN, stating that the birds were in fact buried alive at his facility – but indicated as well that he didn’t believe it was that big of deal. This report was truly an eye opener of the inhumanity and cruelty that takes place in some of these factory farms, and the truth that is being hidden away, so that many people don’t even realize that such cruelty exists. CNN also took on the controversial “AG-GAG BILLS” that threaten to prohibit these undercover investigations, permitting animal abuse and other serious crimes to remain hidden and go unnoticed from the public – and that is a crime itself in many eyes. You see my dear readers, this is why it is so important to expose and reveal the truth – bringing to light the inhumanity and barbaric actions that are taking place even in our own country – and with these “AG-GAG BILLS” they are merely protecting these actions of abuse – protecting the animal abusers/offenders from criminal liability, and it is up to us as a world, as humankind to unite and expose and seek justice for the innocent lives that are not only suffering and dying, but also for those innocent beings who have lost their lives as well. The only way that such cruelty and abuse can be stopped is by spreading the word and sharing the evidence, to reach out to as many people as possible and get them to raise their paws to fight for this abuse to end once and for all ---- We are the voices of the voiceless – and if we remain silent, the cost of this silence will be the innocent lives of animals around the world. Extreme Animal Abuse .. Prosecution is a Must . I agree. Prosecution and punishment should be the same as for abusing humans - and for the owners and the abusers equally. More of us need to educate others and protest.